The Enderby family used this section of the Greenwich riverside where they built a factory. Site marked K1 on Skinner and 152 and 153. It also includes the part of 151 running along the top of the plot – the ropewalk. This was leased from Morden College, who had acquired it as part of a land swap when the gunpowder magazine was built in the seventeenth century. In the 1840s it was described as a paddock and meadow. Some cottages had been built fronting on to Blackwall Lane. Their lease expired in 1854 and it was then leased to a George Smith, and then to a Mr. Keiser. Part of site marked K2 on Skinner – and shown as 149 and part of 151 on the tithe map. This is the main section of the Enderby factory. Section which is K3 on the Skinner plan (the area of the gunpowder depot) The tithe map shows the area (marked 265) further intersected by a pathway which appears to lead to a building which is, perhaps, Salution House. It was in use by a Calvert Clark by 1858. In 1843 the riverfront section also shows a cottage and garden. In 2002 Groundwork said: Enderby’s Wharf – Owned by Alcatel and open to the public during daylight hours. Historic wharf used for, rope and cable loading, in use as recently as 1979 – from here the world’s first transatlantic cable was loaded onto BruneI’s Great Eastern. Improvements have included the provision of new perimeter railings, gates and surfacing, a refurbished and planted boat, and a timber platform for events and displays. The historic cable relay tower was refurbished and cable winding gear made safe and relocated on the wharf. Alcatel’s contemporary activities are represented by a map of their submarine networks around the world, and by the display of a repeater unit as currently manufactured at the site. Additionally one of the Industrial Heritage Interpretation panels is located here. Delivered by: Deptford Discovery Team. Date implemented: 1999-2000 (cable winding gear refurbished 2002) Funded by: Alcatel and LDA .Designed by: JCLA and Deptford Discovery Team. Contractors: Roadways and Car Parks Ltd, James Garner, Alcatel, DDT Ltd. In 2014 everything has been swept away and the site is being developed by Barratts for housing. Salution House is shown on a number of plans – and remains a complete mystery. 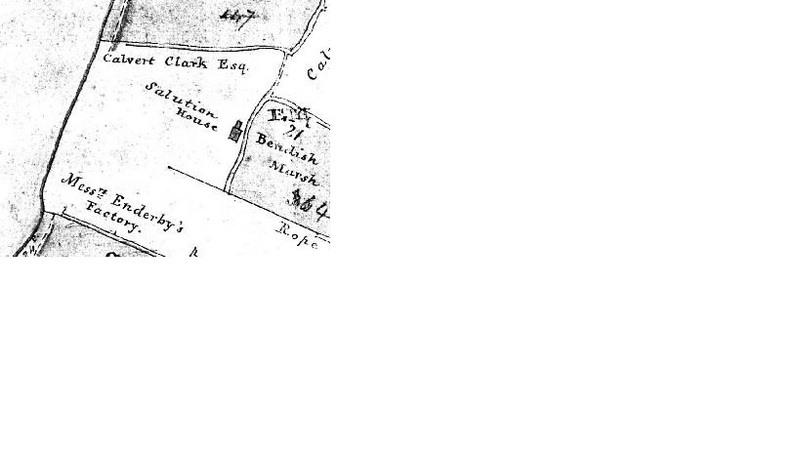 It is marked on a Morden College Survey plan of c. 1800 and, while not marked, can be seen on the 1843 tithe map. It is marked as such on a Morden College deed of 1858 and can still be seen on the 1880s Ordnance Map. ‘Salutation House’ was a common name for a public house at the time – but this building is isolated, inland with no obvious road or footpath access. Clearly the spelling is also different. An alternative is that this is actually ‘Solution House’ and that it has some relation to the bleach works, or vitriol works which was nearby. Reason for removing the Magazine of Gunpowder at Greenwich to some more convenient place and further Distance from the said Town and the Cities of London and Westminster. The apparent Danger the said Magazine is exposed to, of being blown up by Treachery, lightning and other Accidents, arising from its present defenceless Situation and ruinous condition, and the extensive and scare repairable Damage with which the Explosion of perhaps 6 or 8,000 barrels of powder must be attended, cannot but cause terrible apprehensions to all who seriously consider it. I. The Inhabitants of the Town of Greenwich, and the places adjacent must suffer inconceivably in their Lives and Properties, from the Destruction of the Royal Palace, and that superb building the Royal Hospital for Seamen, the much to be dreaded consequence of such an Explosion. And who will pretend to say how much his Majesty’s Dockyards and Storehouses both at Deptford and Woolwich, and even the Cities of London and Westminster, may be affected by it. II .The Banks of the River, not only on the Kentish side, but also on the Essex shore, would be so demolished by the shock, as greatly to obstruct the Navigation if the River; and many ships sailing, or at anchor would in all probably be destroyed. Although the identity of Francis Peyton is not clear there were Peytons active in Greenwich, and in Government circles in this period. In Greenwich in 1636, ‘Thomas Peyton of Deptford’ had been granted a patent for ‘charking sea coals’. Exactly who he was is not known but someone who knew Deptford well was Sir Thomas Peyton of Knowlton near Chillenden who also had an interest in property in the Mottingham area. He had an interest in coal supplies to London since he acquired the right to levy customs on coal for £2,000. John Evelyn knew him, and described visits by mutual friends and social visits in the early 1650s. Peyton had been involved in one of the many skirmishes of the Civil War when, following petitions raised in Canterbury, he was appointed Lt.General of a party of 6,000 horsemen and 1,000 foot soldiers. At Deptford this force met Fairfax who had four regiments of horsemen and three regiments of infantry. Battles ensued at Northfleet and Maidstone. 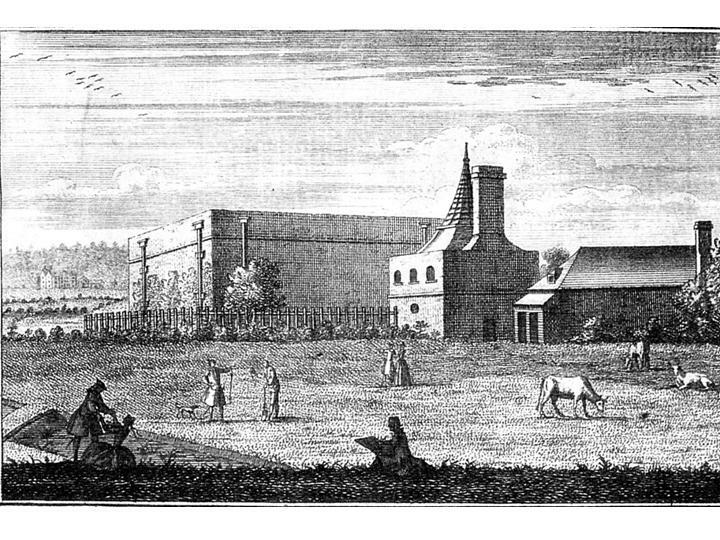 Thomas Peyton’s interest in coke manufacture in Greenwich has been linked to the Deptford copperas works – and it may also be of note that the site around Enderby Wharf may also have been used for copperas manufacture. There were other Peytons who might well have had a relative with an interest in the Greenwich riverside – In 1597 Sir John Peyton, who died in 1630, had been Governor of the Tower of London It must be a coincidence that it was from the Tower that the gunpowder depot was moved by the Government.